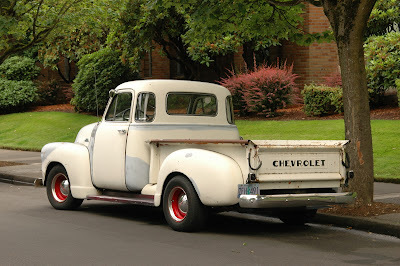 I'm really not into pick-up trucks but this is just beautiful. Thx for the great shots. now that's a thing of beauty. so curvy and the patina works on it. 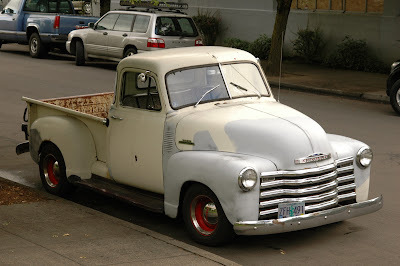 these were always among the coolest pickup's in my book. love those deep dish steelies and dog dish caps, I swear that style of wheel makes anything look good. Oh, YES! What GWT said...the patina is excellent. I wouldn't change a thing about it. X2 what GWT said, this is one BA rig. Ok, yes, this is a really cool truck. However, I can't but help think that the owner has installed lower profile tires. It's a cool look, but I'd much rather see it sitting on whatever size tires and wheels were original to the pickup. I just think it would look a lot more interesting if it were a little higher and the tires were a tad narrower. 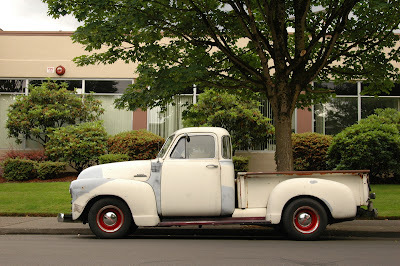 As it is, it kind of looks like a modern person's idea of what looks good on a vintage truck. I also concur that the current level of patina helps make this vehicle work. It's nothing that has to be worried about, so the truck can be enjoyed without worry and stress. You might not want to park this thing under a roof to catch the peel-off, when you're going to tear off a bunch of asphalt shingles, but you could use it for a lot of other solid, pickup truck hauls. I have to agree with anonymous. You guys have some older posts of original'51's and'52's with the original wheels. 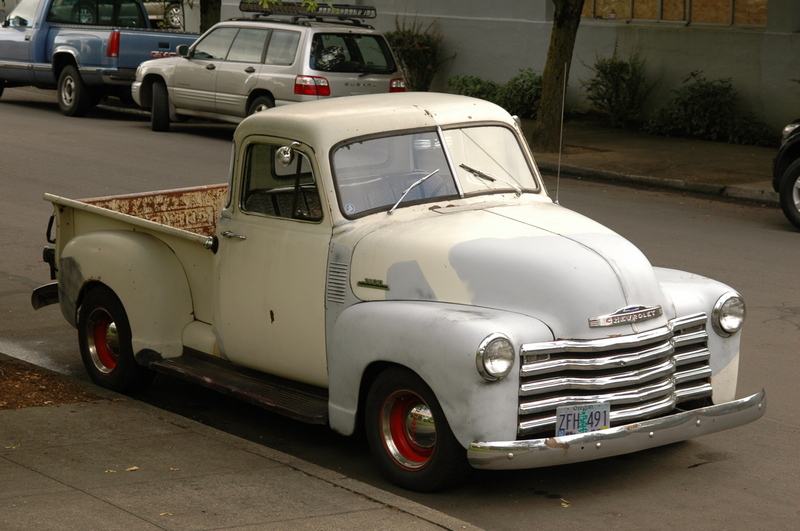 This is a real cool truck no doubt, but the guy is in the process of restoring it. The giveaway is the chrome; repro grille, badging and bumpers. 1951 and '52 there was a nickel shortage (the Korean War) and most all of the GM and Chevys (and all the others too) had the white-out trim. This is a good opportunity to look up the older posts. Ben, Tony, honorary degrees in history? Trucks during this time were for work. Rancheros, Cameos, El Caminos, and stylish trucks are still 6+ years into the future. The 6 volt electric system is history. @clifton: they're on my bucket list, but no. never seen one anywhere except at a car show or at a collector car auction, always restored or garaged to mirror-detailed perfection. what I wouldn't give to see one in a grocery store parking lot or loaded with construction supplies at a jobsite with rocker panels rotted to dust.